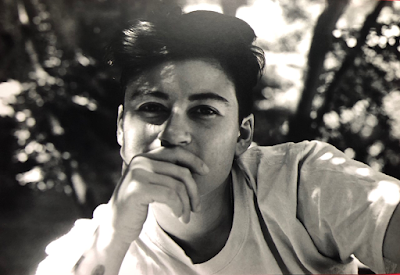 Laura Buccieri is the author of the chapbooks Songbook for a Boy Inside (Belladonna* 2018) and On being mistaken (PANK Books, 2018). Her work can be found in Metatron, DUM DUM Zine, Prelude, Cosmonauts Avenue, Lambda Literary, Word Riot, Apogee, and elsewhere. She is the Publicist at Copper Canyon Press & holds an MFA in poetry from The New School. She lives in Brooklyn and on Instagram at @lauruhboocherry. My book launched at AWP and I remember seeing people carrying it around— having something tangible that represented my work felt really good. I think being able to see my work live on people’s bookshelves is also really wonderful. I was always interested in sounds and the way words play off of one another. When reading out loud as a kid, I had to sound out a lot of words. It made me super detail oriented when it comes to the way a word sounds. I love the cadence of syllables and I love that that can tell a story. I’m also much more inclined to sprint rather than run miles upon miles, sprinting reminds me of poetry. I don’t think I’m a project based writer— I usually write on the notes app in my phone and that is very much a fragmented way of writing. I have pieces of poems, one liners, and full poems on my phone and every couple months or so I’ll copy and paste them into a document on my computer and see what’s there. There is usually a theme because writing is obsession on paper and an obsession at any given moment tends to be about one thing. I tend to edit as I go, so things usually look pretty close to how I first wrote them, minus all the spelling errors. A poem begins with a line or an image that I can’t get out of my head then it really just flows from there. I don’t start working on a book, but rather take things one poem at a time. Absolutely part of. Half of the reason I first got into poetry was because of the community. I love reading and I love supporting other poets and organizers by going to their readings. I remember being in college and being asked to read one of my poems at a reading and that mix of excitement and fear came upon me and I just got addicted to that feeling. I think it is important for me to have people see me and put a face to the poetry. I love when poets take up space and make people confront the art form head on in a physical, communal space. I mean a lot of what I deal with has to do with being queer, but I don’t know how theoretical that is. The world is concerning and childhood is always confusing so those also show up in there, but honestly three’s also a lot fo humor and joy in my work too. I don’t think it is my place to proclaim what writer’s roles should be. I know that reading can be a solitary act and therefore allow people to feel their feelings and process them on their terms. I know that writing has helped me be more of who I want to be in the world. I hope that writing connects people and highlights the similarities that we all have. I hope writing also illuminates a new story or a new word or a new way of thinking that expands the world in a positive way. I hope writing is a community. I hope writing holds people accountable to their actions. I hope writing holds a mirror up to the reader but also offers them a window into a new world. It doesn’t cost any extra to be nice. I write mostly on the notes app on my phone. I don’t write well under the pressure of a blank notes doc. I have a 9-5 at Copper Canyon so the day begins with coffee and advocating for CCP poets and usually ends with dinner while looking over my own writing and reading that of others. I just finished Morgan Parker’s new collection and it was so so so good that every time I read a poem to myself I turned to my partner and said I have to read this to you. I remember coming home very drained from high school and watching interviews with writers, musicians, actors, directors, etc. I’m still so obsessed with that and I’ll spend hours watching and rewatching these interviews on youtube. I think it is really inspiring to see people being celebrated for their passion. It is also another medium (video) to interact with, which always jumpstarts my brain. I feel like I have two homes: my childhood home, which I go back to often, and my chosen home in Brooklyn with my partner. The sprinklers watering the lawn is a smell that reminds me of my childhood home—water on grass, water on pavement. Always in the morning, so the sun is hitting it in the most perfect of ways. These dryer sheets that my partner buys and then scatters on the shelves in our closets, so every time I open the closet door to get my clothes I’m hit with the fragrance and it always reminds me of her and of home, which are really synonymous. All of the above. I can learn to read from reading but I don’t think I could write without being moved by other art forms. I also think writing is a curious art form, so it would make sense for writers to turn to other art forms in order to understand something. Too many to list. But, I’ll tell you what’s on my bedside table right now. Ocean Voung’s new novel. Morgan Parker’s new collection. Lorca’s collected poems. The Secret History by Donna Tartt. Coeur de Lion by Ariana Reines. Freeman’s Journal. They Can’t Kill Us Until They Kill Us by Hanif Abdurraqib. Work books: The Dream of Reason by Jenny George. The Tradition by Jericho Brown. Soft Targets by Deborah Landau. Lima :: Limón by Natalie Scenters-Zapico. It’s a big pile and I’m always scared it will fall over on me during the night. That’s a big question. I’d love to experience what it’s like to be a line cook at a restaurant. I’d love to play in the WNBA. I’d love to live abroad for a year. I’d love to live by the sea. I’d love to be able to run better. I’d love to be able to text faster. I’d love to learn how to be a pilot. And so many more things. I went on an archaeological dig in Turkey when I was in high school and I majored in anthropology so I’d like to think I’d be an archaeologist— underwater archaeologist? I’d also truly love to be a chef. I was applying to MFA programs at the same time as culinary school. So, if I hadn’t gotten into my MFA program, who knows where I’d be or what I’d be cooking. Or honestly, I’d love to just coach my future kid’s basketball team (gosh I hope they play sports) and have that be a career. Bad Moms Christmas made me laugh harder than anything and I was on a plane just laughing/laughcrying at this movie. It was just the oddest thing. Book-wise, well, I read a ton for work and I adore all those books. But, if I took CCP out of the mix I’d say Morgan Parker’s forthcoming collection. She’s a genius. Seriously. I have a chapbook, Songbook for a boy inside, coming out with Belladonna* in Dec 2018. I’m excited for that to be in the world and honored to be a part of the Belladonna* family.